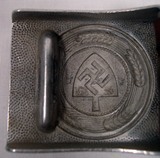 RAD (Reich Arbeits Dienst- National Labor Service) enlisted ranks belt with aluminium buckle. The buckle, designed by the famous designer of that time Egon Jantke, is of the first pattern and was adopted in 1936. On the back is possible to see the year of production (1936) and the acronym LGS of the manufacturer (Gottliebe & Sohne) from Oberstein in Rhineland. Interesting is the double leather tab, also marked with the year, the manufacturer name and, on the back, with an "A", created to protect the cloth of the tunic from the constant rubbing of metal. The leather belt, marked "102", has the tongue in aluminium and a double stitching done in that time. All in excellent condition.